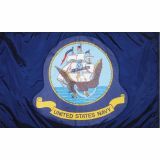 US Navy Flags are available in a range of sizes, models and styles for every occasion and presentation. 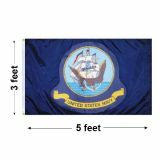 Choose from U.S. Navy Outdoor Nylon Flag, Navy Retired Indoor Light Poly Flag, U.S. Navy Indoor/Parade Flag - Gold Fringe and U.S. Navy Seals Outdoor Light-Poly Flag among many others. Crafted to finesse, these flags make a perfect way to honor the dedication and valour of our sailors. Shop Tuff Flags and take advantage of the best prices, quick shipping and much more! 100% customer satisfaction guaranteed! The U.S. Navy has a proud legacy and we at Tuff Flags have a range of American Navy flags for every occasion and celebration. 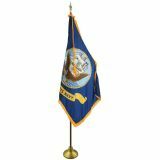 Honor the brave navy personnel by flying a Navy flag. From outdoor flags, to indoor and parade flags and desk-top flags and everything in between, we have everything in US Navy Flags, mounting sets, Navy lapel pins and grave markers, which make Tuff Flags a one stop shop for everything you may need to commemorate the legacy of US Navy. The official Navy flag features a dark blue background with the seal of the Department of the Navy in the center within a circular yellow rope edging. 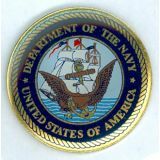 The seal is positioned above a yellow scroll inscribed with "United States Navy" in dark blue letters. Most of our Navy flags are made of superior quality 200 denier nylon that are designed for the outdoors. We have others made of a more economical Poly-cotton for more budget conscious buyers and when the flag will be in a site well guarded from the elements such as a front porch rather than 25' in the air. 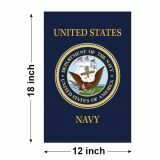 Choose US Navy flags from a range of convenient sizes that range from the hand-held models of 4" x 6” and 12" x 18" to the massive show stoppers of 12’ x18’. These US Navy flags are official and used by our military, governments, and veterans. 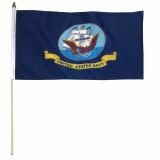 Browse our collection of Navy Flags to choose a flag that complements your need. Should you need any tips, feel free to call us at our toll free number (888) 287-3524 or email us at customercare@tuffflags.com and we are happy to be of assistance.